While in line at the grocery store, I fell for a basic marketing tactic and started looking at magazines at the checkout. Most had no appeal. At least not until I came across the Cook’s Illustrated All-Time Best French Recipes. After thumbing through it quickly, I added it to my cart and took it home. Last night, the rainy weather set the mood for soup. I remembered seeing a recipe for Provençal Vegetable Soup (aka Soupe au Pistou) in the magazine and decided to give it a try. The vegetable soup itself is quite delicious. However, the shining star of the soup is the pistou. Pistou is basically the French cousin of the Italian basil pesto. It is bright sauce made with basil, Parmesan, garlic, and olive oil. I have three different types of basil growing in the backyard, so I used a combination of each. Unlike pesto, it does not have pine nuts. Adding a dollop of pistou to the soup really infused it with a bright flavor of basil. The soup also went well with a few slices of grilled sourdough bread. As spring gives way to summer, seek out a copy of Cook’s Illustrated All-Time Best French Recipes and use the fresh herbs and vegetables in this delicious soup. In addition to my morning cup of Joe, I really like a mid-afternoon coffee. However, it is hard to fathom drinking a hot cup of coffee in the hottest part of the day during the summer in Florida. So, I usually prepare cold brew over the weekend to have for the upcoming week. I found myself wanting coffee this Sunday afternoon, but I had no cold brew ready to consume. Although I was tempted to go get coffee from one of our many excellent local coffee shops, I really didn’t want to go anywhere. 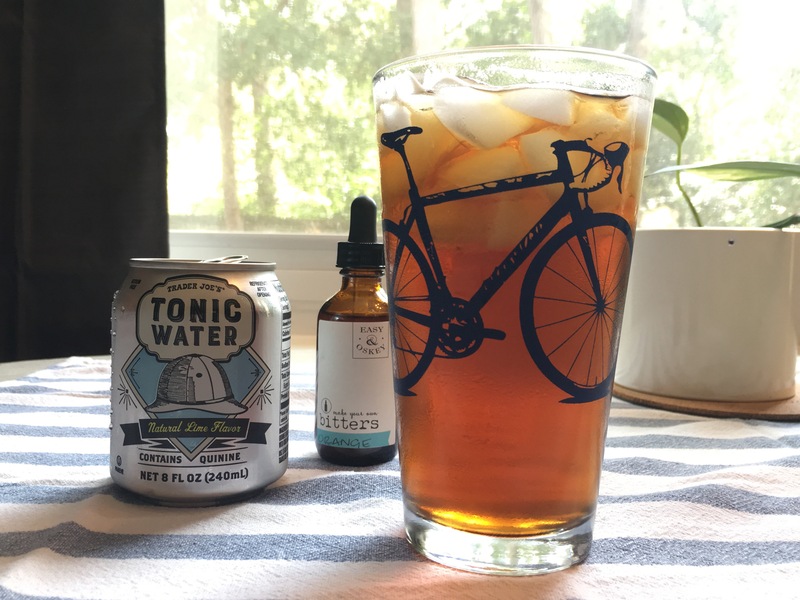 I decided to mix things up a little and make a coffee and tonic instead. Pack a pint glass full of ice. Pour 3 ounces of freshly brewed, hot coffee over the ice. For this recipe, I suggest a brighter coffee with citrus notes. Top off the coffee off with 4 ounces of tonic water. Add 2 or 3 dashes of bitters and stir with a spoon. I used orange bitters, but you can use whatever bitters you prefer. I love donuts. Who doesn’t love a good donut? When I learned that a new local business could be bringing organic, vegan donuts to Tallahassee, I became very interested. Learning the donuts would be delivered by bicycle just made me giddy. That’s right, Dandelion Donuts will be delivering organic, vegan donuts by bike (the freight bike in the photo below). Dandelion Donuts graciously sponsored Breakfast on the Chain, a monthly breakfast for bicycle commuters in Tallahassee, last month. This was my first opportunity to actually taste the donuts. I started with strawberry-basil. I appreciated how the natural berry and herb flavors came through. This was a welcome change to the artificial colors and flavors found on so many donuts. I also appreciated that it was not as sweet as donuts I usually come across. This made me feel better about eating a second one; this time a chocolate with cocoa nibs. Last week, I attended the launch party for their crowdfunding effort and sampled a summer herb donut. Like the Strawberry-Basil donut, the summer herb had a bright flavors. I am definitely looking forward to these being readily available. It was clear from the number of people at the event that I am not the only person excited about these donuts. If you like donuts as much as I do, watch for these to roll into our community soon. Fill a large pot with water and add salt to make it very salty. Add potatoes to the pot and bring the water to a boil. Boil until you can easily stick a fork into the potatoes, about 15 minutes. Remove the potatoes and set them aside to cool. To the pot of boiling water, add the green beans and blanch for 3 minutes and move them to a bowl of ice water to quickly cool them down. While the potatoes and green beans cool, carefully place the eggs into the pot of boiling water. Turn the heat to medium and put a lid on the pot. Cook the eggs at a simmer for 11 minutes. I love that I can use the same pot of water for all of the cooked components. Remove the eggs and place them in a bowl of ice water to cool them down. Quarter the potatoes, drain the green beans and place them on a towel to dry, and peel the hard boiled eggs and cut them in half. Place the lettuce in a large serving bowl. Compose the salad by grouping together the salad ingredients on top of the lettuce. Season the salad with salt and pepper to taste. In a jar, combine all of the ingredients except the olive oil. Mix well. Slowly whisk in the olive oil to create an emulsion. If needed, place a lid on the jar and shake prior to serving. I especially like the fresh thyme in this dressing; the flavor really comes out and enhances all of the salad components. The salad can be served immediately with the cooked components still warm, or it can be made ahead and served cold. Top the salad with the dressing and enjoy. After a truly memorable dinner of tapas and wine at Cúrate in Asheville, I took a momement to briefly thumb through their cookbook on my way out of the restaurant. While I did not take enough time to really absorb the photos and recipes, one page stuck with me. Their recipe for Tomato Bread included a description of rubbing garlic and halved tomatoes directly on toasted bread. Beautifully simple and rustic. A couple months later, I picked up the vegetables from our CSA one evening and I was handed a brown paper bag full of fresh tomatoes. My first thought was to make a red sauce for pasta, but then the recipe for Tomato Bread stirred in my mind. Not remembering the specifics, I searched the Internet for Pan con Tomate (tomato bread). First, make a small cut in the bottom of the tomatoes. Then, grate the tomatoes into a bowl, discarding the skin. The small cut helps start the grating process, otherwise the tomatoes slides along the grater rather ineffectively. The skin generally remains intact and is easy to remove from the top of the grater. Season the tomatoes with salt and minced clove fresh garlic to taste. I used about a half teaspoon salt and one clove of garlic to about two cups of grated tomatoes. Slice a baguette in half longwise horizontally, then slice each half into 2 inch wide rectangles. Drizzle the bread with olive oil and broil it until browned. Rub a clove of garlic over the crispy bread and spoon the tomatoes over it. Finish with a light sprinkle of salt and a light drizzle of olive oil. Because Pan con Tomate is such a simple dish, the quality of the ingredients is very important. The tomatoes needs to be fresh and ripe. The olive oil should also be good quality. When done well, the dish should invoke feelings of eating at the beach or traveling the Iberian Peninsula. Pan con Tomate makes a great tapa or a light dinner. It also goes well with a larger spread. A few months ago, Jill and I hosted a prohibition themed party. Researching food and drinks for the party, we came across a cocktail named the Bee’s Knees. Once we came across this cocktail, we began to see it more and more often. The cocktail (or a variation of it) is a regular feature on the menus at Liberty Bar and Restaurant and Madison Social. Here is my version of the cocktail. I use Beefeater London Dry Gin in this particular cocktail because of how well it pairs with lemon and orange peel. The lavender complements the honey well. Add all of the ingredients to a cocktail shaker and shake with ice. Strain into a chilled cocktail glass. Garnish with a lemon twist. Stir the lavender and orange peel into the water in a pot over medium-high heat. Once the water begins to simmer, add the honey and stir until completely dissolved. Once cool, strain out the lavender and orange peel. Store the syrup in the refrigerator until you are ready to use it.